There's a stunning ocean view that I'm smacked with as I make the turn onto Adelaide, and just before the first set of the Santa Monica stairs greets me. I'll have to get a picture of that view soon, because it's one of my favorites. You're just going about your business one minute and the next, there's this amazing and expansive view of the ocean. The sun is almost always shining and dancing right on top making it seem like you could go ice skating. I always feel grateful for being exactly where I am in that moment. And then as if it couldn't get any better, I get to walk along Ocean Avenue where I get to watch the ocean, the waves, the people on the bike path, the Santa Monica Pier and be among all the other health-minded individuals who are running, walking, biking or working out along Palisades Park. 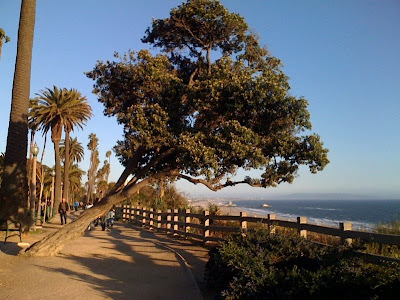 Today as I was walking along Ocean Avenue I saw this tree and had to take a picture of it. I can't tell you how many times I've walked by this tree and never noticed how it is leaning towards the ocean. But today I was open to seeing new things and had to capture this picture. I know I pass by things every single day that I've never noticed before. I guess that's part of the excitement of rediscovering new things all the time. But I also think it's a wonderful reward of really having your eyes open and slowing down the pace of life to notice these kinds of things.